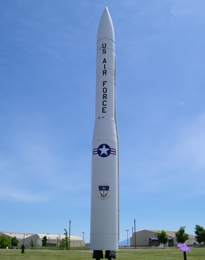 Malmstrom Air Force Base, located on the eastern border of Great Falls, Montana was the first to deploy the Minuteman I missile in October, 1962. This ICBM, Intercontinental Ballistic Missile, was designed to be launched within minutes of confirmation of launch, and carry a 1.2 megaton nuclear warhead over 6000 miles within 30 minutes to its intended target. From that initial day in 1962, leading up to April 21, 1967 a total of 1000 Minuteman missiles were actively deployed by the United States Air Force across a total of 6 missile wings. Construction of the 1000 Launch Facilities that housed each of these Minuteman ICBM missiles individually, including the 100 Launch Control Centers that controlled these missiles, was by no means a small undertaking. Within a time span of approximately 5 1/2 years (1962 to 1967) there were 1000 Minuteman missiles deployed and operational across the United States. This website is dedicated to the Minuteman missile, as well as the thousands of people who participated in the profoundly immense task of planning, designing, building, activating and maintaining this missile, both present day and in the past. Thousands of lives, military and civilian, were significantly affected, and still are to this day, by the Minuteman program. Within this website you will find a comprehensive library of information on the Minuteman missile, starting from the Minuteman I, to its present day version, the Minuteman III missile. Discussion will include the Peacekeeper missile, also known as the MX missile. There will also be information provided on the SICBM, Small Intercontinental Ballistic Missile, also known as the MX-134. You will find specific information on the missile itself, its targeting system, the variety of warheads used, the missile launch facilities, launch control centers, security systems, the variety of technologies used, and the 6 individual Air Force missile bases that oversaw their respective missile wing, as well as the numerous people necessary to oversee the operation and maintenance of this missile. This website is not affiliated with or connected to the United States Air Force. This author takes full responsibility for the information provided within.